Hardy Hibiscus - Plant Profile - Kalleco Nursery Corp.
What does the word Hibiscus bring to mind for you? Waves, sand, surf? You probably think of somewhere warm and tropical, like Hawaii. Fun fact: you can bring some of those tropical vibes into your own yard, because here in New York, we have Hardy Hibiscus. Hardy Hibiscus grow on upright stems that can reach up to 6′ in height. In late July and August, they bloom massive flowers that are typically 8″-10” – though, on some varieties, the flowers can be up to 12″ (like the ones we have at our nursery). Here in New York, these flowers can range from pure white to delicate pink to deep red. With a flower that large and a stock that long, you’d probably expect some staking. Luckily, these perennials have a thick, woody stem and rarely need any support, even in windy areas. Those thick stems might require something a little more robust than your regular clippers, but Hardy Hibiscus is otherwise like any perennial. Cut it back to about 2″ above the ground in the late fall. When the rest of your perennials bounce back in the spring, you might get a little worried that your Hibiscus didn’t make it. Don’t panic; these are late bloomers that take a bit longer to get going, as they need slightly warmer weather. Once they’re green, they’ll grow quickly. You can dead-head spent blooms through the bloom period to encourage more flowers! Hardy Hibiscus lives up the “hardy” in its name in a couple of ways. First, it’s deer-resistant! Second, it’s fairly adaptable. It prefers moist areas, but it can flourish in well-drained soil as well. And third, it’s extremely tolerant of salt, so it’s a great choice for roadside plantings where more sensitive plants might suffer from de-icing efforts in the winter. Since it’s native to wetlands, Hardy Hibiscus love wet areas that get lots of sun. They’re a perfect solution for problem areas in your yard where the soil might not drain as well. We recommend a large planting alongside a stream or pond for a late summer surprise! 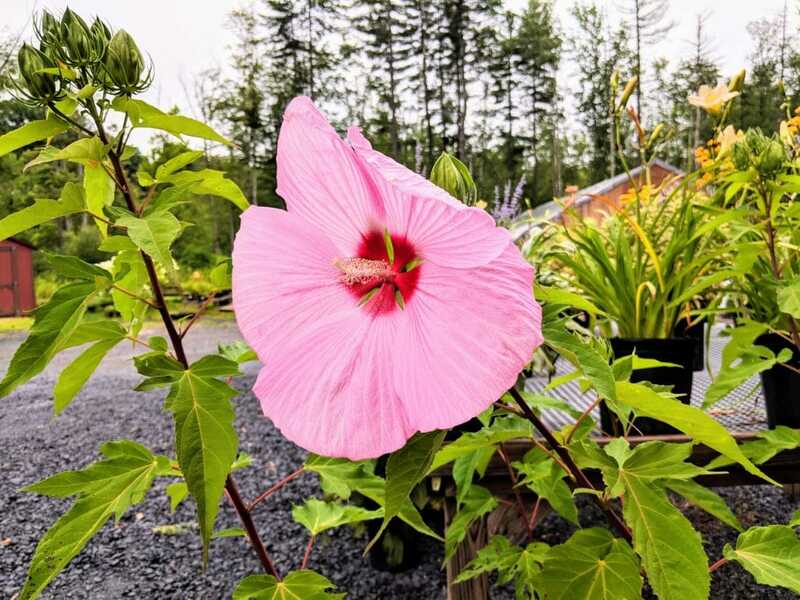 The hardy hibiscus is very tolerant of salt as well as water so it can be a good choice near roads where salt runoff is occasionally an issue in the winter. Hardy Hibiscus is a pollinator favorite. The bright colors and sweet smell attract honey bees and butterflies galore. Plus, they help support your avian friends as well! Its late bloom period and large number of seeds mean they make a tasty snack for local birds as you head into the fall. Join our mailing list for tips, updates, sales, events, and more!